A high-speed chase involving multiple agencies, several hit-and-run crashes and a violent carjacking in Orange County ended when a police K-9 took down the suspect. The man -- who was wanted for assault with a deadly weapon on an officer last week -- led police on a chase that started shortly before 5:30 p.m. Monday in Garden Grove. 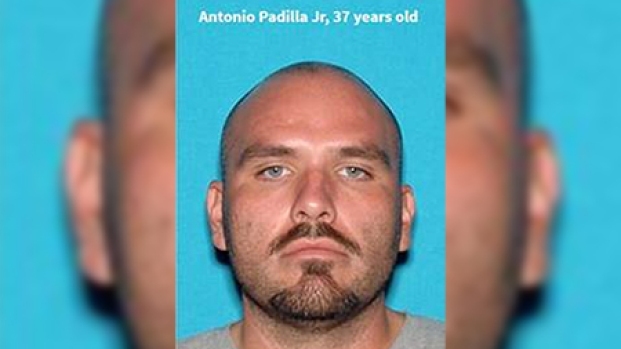 The suspect in that Feb. 18 incident was identified as 37-year-old Antonio Padilla Jr. of Riverside County. Padilla was also wanted for a current parole violation. A wild pursuit that started in Garden Grove on Monday, Feb. 26, 2018, ended in Irvine. Undercover detectives with the Garden Grove Police Department spotted Padilla driving a black GMC pickup truck Monday and attempted to stop him. That's when the pursuit started. He drove in the emergency lane of the freeway, blew through red lights and crashed into at least two other vehicles while trying to evade officers. Antonio Padilla Jr., 37, was wanted for assault with a deadly weapon on an officer on Feb. 18. He led officers on a multi-agency pursuit on Monday, Feb. 26, 2018. Padilla eventually violently carjacked a woman at an Irvine apartment complex, throwing her out of her Audi and jumping behind the wheel himself. The woman's brother who tried to intervene was nearly pinned in between the pickup truck and the Audi before the pursuit suspect sped off. "I saw that he was taking my sister out of the car and I just reacted and tried to help," Ricky Kozloski said. Kozloski and his sister were unharmed. The chase continued for nearly ten more minutes before the wanted man ditched the Audi in an Irvine industrial park and attempted to run away. A police K-9 tackled Padilla at Kelvin and Derian avenues around 5:50 p.m. and he was taken into custody after a brief struggle. An ambulance was ordered to the scene for injuries Padilla sustained during the arrest.